Unfortunately I recently wrecked my WH-9000 C24s in a crash, but no doubt they were the best wheels I've ever owned - and I've had some good ones! Dependable, stable, fast and light... with an alloy rim surface for superior braking, I WILL own another set some day! They are on my Ti road bike and replaced some 6-year old Velocity A23 pro wheels that cracked at several spoke holes on the rear wheel. I wasn't interested in deep carbon wheels but wanted something light weight. They are great but with one small problem. The rim strip on the front wheel had a little sharp point at the valve hole. This lead to several punctures at the base of the valve stem. Once I diagnosed the problem, I put some electrical tape over the area which seems to have solved the problem. In retrospect, I should have used a soldering iron to melt the offending sharp point. The 9100 C24 wheeset is a great, lightweight, wheelset. 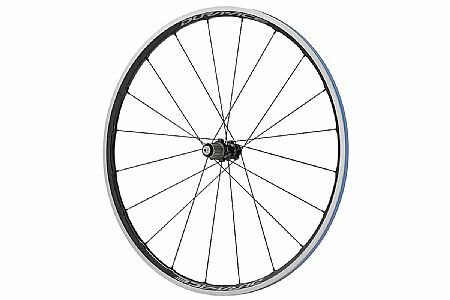 If you're climbing plenty of hills andor just want an all around wheel, this is the wheelset to get. The 9100 is replacing my 7900 C24 and I noticed a difference with the noise every rear freewheel hub makes. Freehub noise is a little louder than the 7900 C24, however, it is still silent when compared to most wheelsets. Drafting off another cyclist can still be done in stealth mode. Was very excited to purchase the new wheels upgrading my 2013 Cervelo S5 (upgraded from Ultegra to Dura-Ace) from 2011 Mavic Ksyrium Elite Road Wheelset to the C24s. Pulling the wheels out of the box I was amazed at how virtually identically the rim was to my 2011 Mavics (odd). Also, no aerospokes on the C24s (another negative). My Mavic's worked great and the wheels had no problems at all. Now and while I will caution I am a Clydesdale rider, I am getting frequent flats under very slight pavement imperfections or riding over debris on the road (gone through four tubes in the dozen or so rides on the weekend since I received the wheels). Getting snakebites every time on the tube when I have checked the pressure prior to every ride. And the latest tubes were even slimed to no avail. The tires were brand new Continental 4000s when I received the new wheels. Almost want to upgrade and go back in time to the Mavics. I was looking for a stiff and light wheel set to replace my Easton EA 90s that were breaking spokes. I wanted a reputable, known brand that could be serviced anywhere. I like to climb, so I wanted something light and stiff, not necessarily the fastest set. These Dura Ace wheels are fantastic! They make the bike seem to float uphill. These wheels are great! Worth every penny. I upgraded from Mavic Ksyriums and these are well worth it. I didn't want a deep dish wheel and I love climbing, descending, and cornering on these. I used to race locally and would feel very comfortable racing on these, but in every sense, these are my 'every-day-riders'. Purchased to replace an original equipment Shimano set of wheels that had more than 25,000 miles on them. These new Shimano wheels are superior wheels in terms of ride, tracking, responsiveness, and additionally, they are nice looking. A truly valued purchase for the price point. These wheels are great. Have a 2013 Tarmac pro and I believe are a more durable and just a light upgrade to the original wheels. I do not need aerodynamic wheels as usually ride in a group and hills are my most concern. The inner rim width is fine for me especially at the pricepoint. If you want a proven set of wheels at a great price and don't have to have the latest and supposedly greatest thing for at least twice as much money, then these wheels will do the job and then some. Shimano got it exactly right. If you race or ride very aggressively with your club you will enjoy and benefit from this design. Light but amazingly stiff, great power transfer for hammering on flats and climbing. Terrific confident descents. I run Continental GP4000sII tires with these on a Tarmac Pro. You won't be disappointed! Biketiredirect has them under $800 on sale from time to time. Great investment! Excellent Deal! Bought these to replace Mavic Ksyrium Equipe. True, bad comparison. BUT, what a difference. A lot of climbing where i ride in NorCal. Wheels are light, solid and alloy braking surface. They weighed in lighter than a new set of Enve SES 3.4 DT Siwss 240s. Very smooth and a lot more forgiving but at the same time more direct power than the Ksyrium. So much so that even i could notice it immediately. My only gripe is that for so much money, they could have had Ti skewers. Guess you need to spend thousands before you get $ Ti skewers! Would be a no brainer climbing wheel with Ti skewers. Lost a star on that. Performance 5 stars. Comes w wheel bags. Best wheels I've ever had. Light, responsive and durable. A lot of long rides. Wheels holding up very well. I have used Dura Ace wheel sets for over 5 years now and they never disappoint!